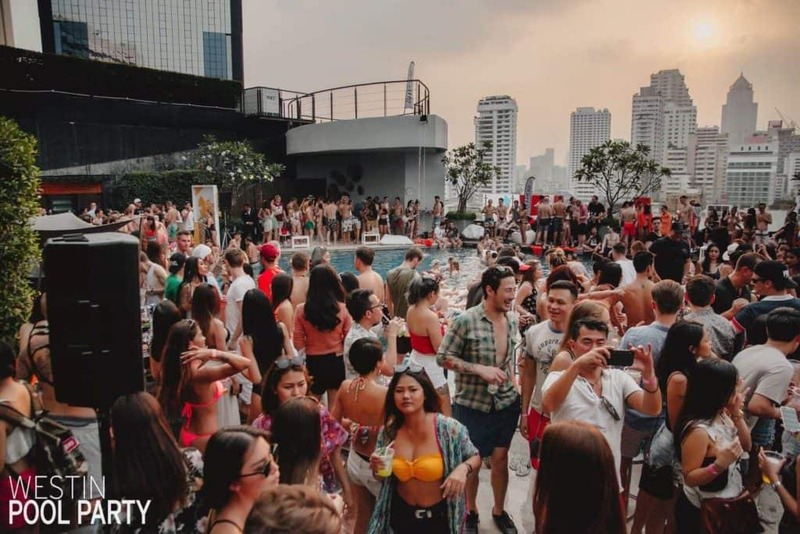 The Westin pool party is hosted at the Westin pool terrace rooftop area and will combine an action-packed pool party in Bangkok with a host of live-DJs who will play some cool tunes. The Westin Pool Party is always a lot of fun! Westin Grande Sukhumvit Hotel is known as one of the classiest Bangkok hotels and is also famous for hosting one of the best pool parties in Bangkok. Westin Pool Party will usually take place on the third Saturday of the month. The Pool Party is the place to be for all the beautiful people in Bangkok. Westin Pool Party Makes People Meet, Splash and Laugh in the heart of Bangkok. The Westin Grande Sukhumvit has almost become famous as a party hotel with its hangover brunches and pool parties for the party elite in Bangkok. You can find one of the best parties at the Westin. The Pool Party is one of these long-established hotels that still has its voice regularly heard in the city of devils and angels with great parties for the party elite communities. Westin Pool Party is Bangkok’s Famous. It has also made a name for itself with one of the best pool parties in town and guarantees a splashing Bangkok rooftop pool afternoon. Swimming and talking and watching the view. The building’s rooftop terrace hosts the Westin pool party. This Bangkok pool party will combine live-DJs, splashing fun and great people. The party will feature numerous DJs playing a great selection of House and Nu-Disco music. Are you looking for a great afternoon and early evening on the roof? Enjoy an excellent selection of house and nu-disco, alongside some fresh hip-hop and other hits. Advanced booking is required to avoid disappointment. Get your party buds to the Westin and Splash in the Pool. You can book your Westin pool party ticket in advance. Tickets start at 400 baht including one free welcome drink. Special drink packages are available on the day. You also can book the Westin Hotel or one of the other Bangkok hotels. Other pool parties in Bangkok are at So Sofitel and DoubleTree by Hilton. Dine along the Beach is a collaborative culinary initiative between five different beach hotels in Hua Hin and takes this month place on Thursday 27 September 2018.